In this display, Morley printmaking students show work from two different projects: Silkscreens and the Black Circle project. 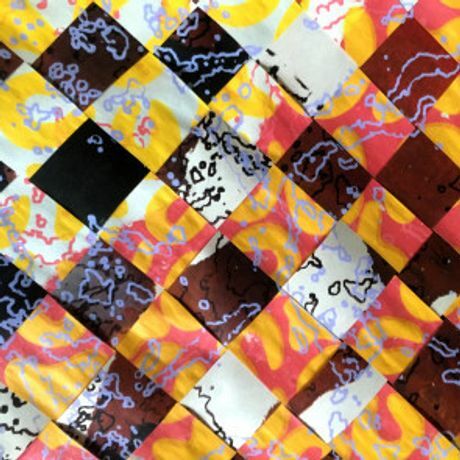 The silkscreens show how students have explored a wide range of screen printing methods. In the Black Circle project, the students demonstrate how a simple object can be a springboard for different interpretations and ideas. The students show how they have interpreted the projects in their individual ways each expressing their inspiration through different printmaking methods. Both projects were led by tutor David Holah. This project consists of artwork by the students on the Silkscreen on paper course. The prints chosen represent the varied techniques employed to explore different methods of screen printing, including making stencils, exposing an image onto a photosensitive screen and by adding a wax mask to the screen using Tjanting tools. Students have applied these methods to create the outstanding and unique artworks on display. In his 1927 book The non-Objective World Kazimir Malevich wrote: ‘In the year 1913, trying desperately to free art from the dead weight of the real world, I took refuge in the form of the square’. The Black Square is an ordinary object but it can be seen and depicted in numerous ways and demonstrates how a simple object can be a springboard for different interpretations and ideas. In response to the earlier Black Square project set by Michelle Avison, Head of Printmaking, students were asked to explore the theme Black Circle. They were encouraged to think about surface, texture, ink, the qualities of different techniques, and also look at architecture, reflections, symmetry, texture, geometry, and artists working in the Suprematist and Geometric abstraction tradition.